I would describe cloud as decentralized computing, opening a seemingly endless array of servers and services for computers and other devices to connect to. This can be empowering, but at the same time, dangerous if not conceived and designed with security and manageability in mind. Another important consideration is how analogous the devices become connected to this cloud network. Collaboration and sharing of information should be a paramount concern; moving to the cloud without easy access to shared data is destined to fail. The more homogeneous security and collaboration is, the more complete the cloud solution will be. There are very few true cloud platforms that can successfully cater to an average small or mid-sized business. Enterprise has long since been the early adopter of cloud computing, but even in the Enterprise space, there is no clear platform of choice. Enterprise class cloud platforms are not ready made to work for SMB either. The pricing models for Enterprise cloud could easily be in the thousands of dollars per month, making it unaffordable for even the most progressive SMB. On the other end of the spectrum, entry level cloud solutions merely focus on file sharing and basic collaboration tools, leaving several key elements to be sourced from other vendors. This void has recently been addressed by Microsoft 365. 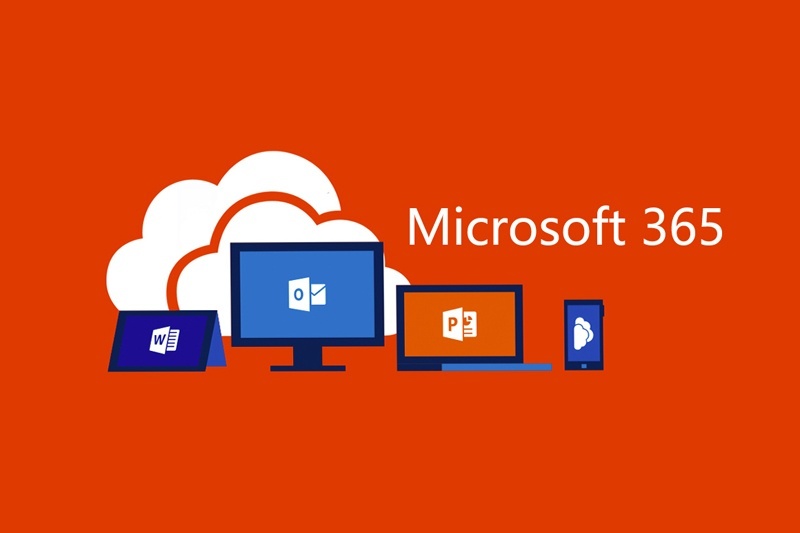 Not to be confused with Office 365, Microsoft 365 is an innovated cloud platform that opens the doors for many SMBs to safely consider migrating to the cloud without compromise. Office 365 has been wildly successful for Microsoft – they already have over 120 million active monthly subscribers with incredible growth each month. Microsoft 365 Business builds on the feature rich Office 365 Business Premium Package and adds Windows 10 operating system, enterprise grade mobility and security features. The Microsoft 365 Business package can really replace the server in many SMB environments, removing a significant capital investment in hardware that would have a limited shelf life of 4 or 5 years. If you are currently considering a new server or a move to the cloud, Microsoft 365 Business needs to be on your radar. If you are facing one or more of the following “compelling events”, the timing may be right for this move – this is the first consideration. If you don’t currently have a compelling event, it doesn’t necessarily mean you shouldn’t consider a migration to Microsoft 365, but it may be harder to justify the costs associated. If your file server is less than 3 years old, consider utilizing the residual value of the asset first before planning the next step. It may take 2 or 3 months to properly assess your readiness for the cloud so consider this in your timeline as well. An interim step of utilizing Microsoft 365 in a hybrid way with on-premise Active Directory is also a good option to explore if your server hardware still has functional life and support. Secondly, I would suggest evaluating any cloud offering by reviewing the performance of your Internet connection. Does your office Internet have sufficient bandwidth, both upload and download, to support file transfers without being annoyingly slow for your users? In many major centers, 100 Mbps + Internet service is an affordable reality now, making the download of files, emails, and any other connection realistic. The upload is also an important part of this, make sure that the service is symmetrical (balanced upload and download) or has at least 20 Mbps or greater upload. If your organization has more than 100 people or has more demanding needs, fibre Internet should be considered as well. Keep in mind that most servers in a business network have the potential to connect over a physical network at 1 Gbps speeds, which could be 10x the speed of a good Internet connection. But for the most part, the file server in a typical SMB business network does not utilize this capacity, at least in any sustained way. The reliability of your Internet connection is another aspect to consider. If it isn’t stable and reliable, you should consider another ISP option or a secondary Internet connection for failover. Most business grade firewalls support the binding of two different ISP Internet connections (e.g. take two separate 50 Mbps Internet links and combine them into one 100 Mbps connection), so this should be a reasonable undertaking to ensure connectivity remains as stable as possible. Most ISPs have a 99.9X% available SLA for business grade Internet service so reliability isn’t as big of a concern as it was a couple years ago. As an example, 99.99% SLA is equals 4 minutes 19 seconds downtime in a month, so generally not that big of an impact. The third aspect to consider, is how “change ready” your team is (or yourself for that matter)? In many respects, a move to the cloud can bring significant changes in the way things work on a network. If your staff isn’t mentally prepared for change, or is fairly entrenched in the way they work, a migration to the cloud is going to be difficult without clearly explaining the roadmap of what is to come. With change comes great opportunity, but also fear. Think of the challenges of migrating from Windows XP to Windows 7 – menus changed, icons look different, the entire user experience was seemingly more complicated, and users became frustrated. But looking back now, upgrading from XP enabled so many new features and functions we would never want to go back. In technology, there is nothing more constant than change and it is always best to come to terms with it and move forward wherever strategically possible to do so. Cloud computing can be defined as a competitive advantage and a strategic move for most organizations so prepare with an open mind and help support others who struggle with change through training and additional support when required. Many SMB sized companies have a mix of devices and operating systems in their network. It is not uncommon to see an old Windows Vista or XP computer from time to time. The fourth consideration is migrating to Microsoft 365 requires Windows 10 Business Edition (upgrade from Win 10 Pro) installed on the PCs for full integration with Microsoft 365 so be prepared to replace some older gear (Windows 10 is the first, built from the ground up cloud ready Operating System from Microsoft). Microsoft 365 includes the Windows 10 Business Edition upgrade entitlements from Windows 7 and 8.1 as part of the package but Vista and XP are end of life and will need to be replaced. Microsoft has stopped updating these operating systems so there are security reasons to replace these devices anyways. MacOS, iOS, and Android are also supported and manageable from within Microsoft 365 so the freedom to decide on the device is up to your imagination. The number five consideration is a big one. Legacy applications that have a local server dependency are a major roadblock to fully jumping into the cloud model with Microsoft 365. If you have the networked / multiuser versions of QuickBooks, Sage, or a Line of Business Application with a database, we would need to find a suitable alternative. This may mean that a physical server is still the right choice for your business, but in many instances, clients have found an online version of the application they are using, and we migrate the data. Dynamics 365 Business Central, QuickBooks Online, Xero, and Sage Business Cloud Accounting are popular choices. And if you have a Line of Business Application that doesn’t have a cloud option, there are ways to convert the application to something remotely hosted on servers at Microsoft Azure instead. They can appear installed on PCs the same as they did before but are now connected and streamed over the Internet instead. Legacy applications require professional evaluation so be sure to contact an IT Service Provider for advice and guidance before jumping in.Many SMB sized companies have a mix of devices and operating systems in their network. It is not uncommon to see an old Windows Vista or XP computer from time to time. The fourth consideration is migrating to Microsoft 365 requires Windows 10 Business Edition (upgrade from Win 10 Pro) installed on the PCs for full integration with Microsoft 365 so be prepared to replace some older gear (Windows 10 is the first, built from the ground up cloud ready Operating System from Microsoft). Microsoft 365 includes the Windows 10 Business Edition upgrade entitlements from Windows 7 and 8.1 as part of the package but Vista and XP are end of life and will need to be replaced. Microsoft has stopped updating these operating systems so there are security reasons to replace these devices anyways. MacOS, iOS, and Android are also supported and manageable from within Microsoft 365 so the freedom to decide on the device is up to your imagination. Number six, if your file server is loaded with large files and folders or you have a complicated data structure, migrating to Microsoft 365 may not be possible without significant analysis and cleanup. OneDrive and SharePoint effectively become the new file shares (called libraries) in Microsoft 365 so you would need to conform with how these work and operate. Files with special characters like <, >, :, ", |, ?, *, /, \ are not supported in OneDrive or SharePoint and would have to be renamed. The file path, including name of the file cannot be longer than 260 characters for OneDrive and 400 characters for SharePoint. Both OneDrive and SharePoint have limits on number of files and capacity of the libraries, so it will be important to consult with a professional before proceeding. This web page at Microsoft explains some of the limitations and restrictions here: https://support.microsoft.com/en-ca/help/3125202/restrictions-and-limitations-when-you-sync-files-and-folders. In addition to file complexity, file and folder permissions should be reviewed and properly mapped out before the migration, ensuring sensitive documents for HR or Finance can remain secured. These permissions should be reviewed periodically anyways to remain accurate and up to date. As you can see, the additional features of Microsoft 365 Business at a high level, are Device Management and Security, two critically important requirements for any SMB. To consider a cloud solution as comparable to an onsite server, management and security are a must. And when you consider the difference in price per month (about $9 CDN), it is really a no brainer. 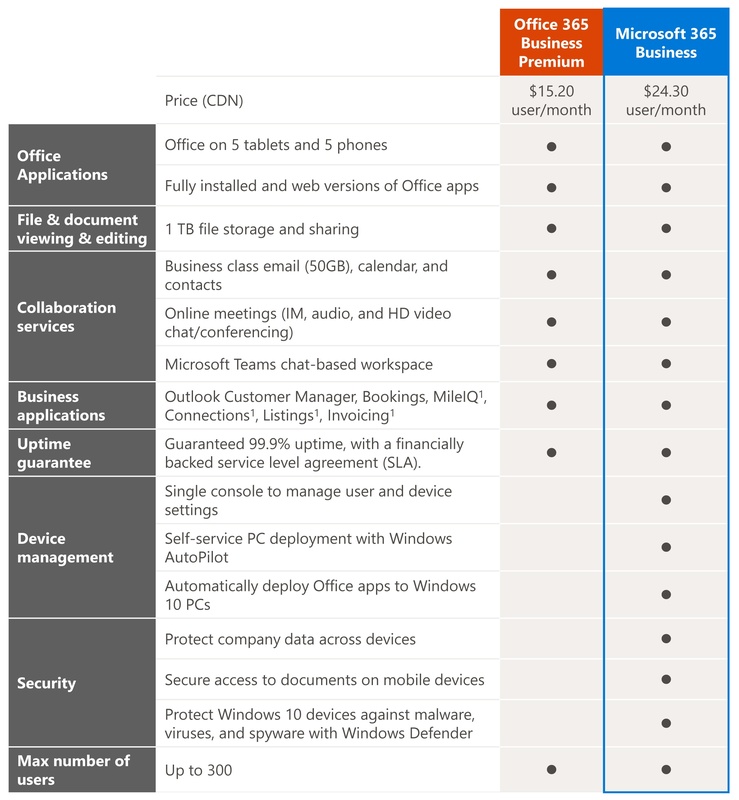 For comparison sake, some of these features are offered as a standalone service called Microsoft Enterprise Mobility and Security which is normally priced at $10.60 CDN by itself, plus you add the other Microsoft 365 features including Management Portal, AutoPilot, Windows 10 Business Edition Upgrade Entitlements, and Managed Windows Defender Anti-Virus, it becomes an substantial package. Unfortunately, some of this product information can be complicated to understand and digest so the value may be unclear if not adequately explained. Naming of Office 365 versus Microsoft 365 is going to take some time for Microsoft to build awareness of the product differences. If you Google (or Bing) the term Microsoft 365 you mostly get Office 365 result links. In the end, when you get past the confusion and add it all up, the Microsoft 365 bundle could cost double or triple the price if sourced from 3rd party vendors. Let’s take a closer look at Microsoft 365 Security, one of the two major enhancements over Office 365. Microsoft recently conducted a survey of SMBs and found that over 71% feel vulnerable to cyber-attack. A cyber-attack can take many forms, including Phishing, Ransomware, Spoofing, and a wide variety of compromises from stolen devices or sensitive data leaks by an employee. Safeguarding your business in the past centered around getting a business grade firewall to protect the network perimeter from hackers. But in reality, fast evolving threats and exploits in recent times have rarely been stopped by even the best firewalls. Most IT Security Experts now recommend several layers of security, instead of just one or two (firewall and anti-virus software). 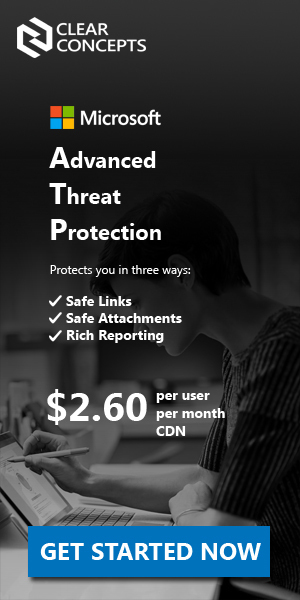 Microsoft 365 includes advanced features to protect your employees from phishing and ransomware, scanning attachments and links to detect and discard dangerous messages or prevent users from accessing unsafe webpages. The package also includes data loss prevention tools to prevent unintentional leaks of sensitive business data including SIN or credit card numbers. And the best part, because the package is so inclusive, these additional features are not complicated or an additional charge. Device management is often overlooked, or only the concern of the IT team. With such a wide variety of devices Internet connected, the remote management of these laptops, tablets, and smartphones should always be top of mind. With a cloud platform like Microsoft 365, devices are no longer confined to the local network, so businesses will find powerful new ways to leverage mobile computing. If a device is lost or stolen, the cost to replace the device is only the beginning; there is a much higher risk associated with lost data, which could be sensitive or subject to compliance regulations. Microsoft Intune is a product you may not have heard of, but it is a feature rich Mobile Device Management (MDM) solution included in the Microsoft 365 Business package, giving you the power to lock down devices, can remotely wipe email or other sensitive data, apply encryption and data loss protection policies. The Microsoft 365 MDM solution works for employee owned (BYOD) devices as well, ensuring that company data is handled separately from the employee personal data (selective wipe of corporate email for example). Digital transformation is top of mind for many SMBs today; making a step towards cloud computing or cloud services can help improve the agility of your business and enable your team in powerful ways. Microsoft has really stacked the deck with modern management of a SMB business network with Microsoft 365, including some of the best next generation cloud technologies for security, communication & collaboration. As we move towards the end of support for Windows 7 (January 14th 2020), Microsoft is making significant technological changes in preparation for a truly cloud based business network without the need of physical servers, and Microsoft 365 is leading the way. If you have reviewed the qualifications in this post and believe that Microsoft 365 is an option, I recommend the following steps. Upgrade systems to Windows 10 Business Edition with Microsoft 365 entitlements. Set a schedule that works to incorporate the data and email migration, computer setting changes, DNS settings, device enrollment, and final cutover. Ensure adequate IT support is in place post migration – although a physical server is no longer required, trained technical support is recommended to ensure Administration, Change Management, Permissions, PC Client and Network etc. are properly supported. IT Managed Services, bundled with Microsoft 365 is an simple and effective way to accomplish this (support per seat per month). Clear Concepts Managed Cloud Services are detailed here: Managed Cloud.